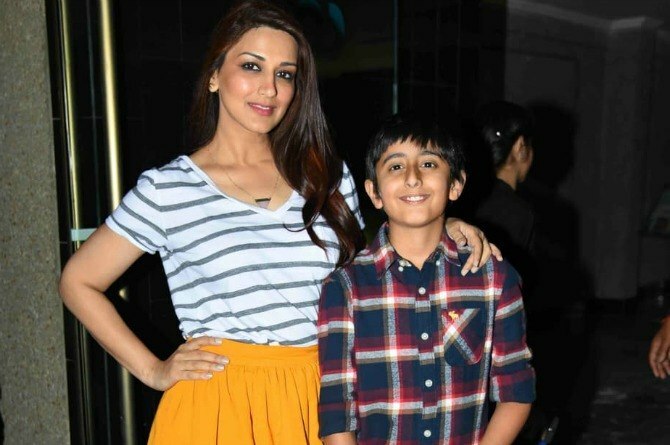 11 Pictures That Prove Sonali Bendre Behl Is The Most Adorable Mum! With a career spanning almost two decades, the bubbly Sonali Bendre Behl, has proved that talent and courage can withstand the test of time any day. Not only has she made a name for herself in the film industry, but she has also been a constant fixture in the television industry for quite sometime now. And now, the mother to 10-year-old Ranveer and wife of filmmaker Goldie Behl, Sonali has added another feather to her cap, that of a published writer. She recently released her book The Modern Gurukul – My Experiments with Parenting (of Penguin Random House), that she says "comprises notes of wisdom, nuggets of knowledge and tips on being a parent collected over the years." "Getting married and having children is an evolution process. A live social experiment no one is documenting. All we have is the knowledge passed on to us by our elders, experiences we inculcate and hardly negate. But to bridge the generation gap, one needs to adapt to the new while retaining the goodness of the old," said Behl while speaking to a leading daily about her book that talks about combining the vedic way of bringing up children as well as adapting to the smartphone generation. In her book, she also highlights the importance of a father's role in parenting. "There is a whole chapter on fathers. Goldie is a hands-on father and I feel, new age dads are involved in every aspect of their children’s lives. Now, that is being macho," she says. As for her son Ranveer, Behl is teaching him like the gurus in Gurukul, I had to improve on myself for my son to emulate values of compassion, respecting others and knowing that to every action there is going to be a reaction. “My son can be as open as he wants with me, but he cannot forget I am his mother and that all will not be forgiven,” said Behl. As for parenting him she says, "Like the gurus in Gurukul, I had to improve on myself for my son to emulate. For instance, for my son to be fit, I too had to be fit and joined the gym." Behl who recently celebrated Mother's Day with her mum and posted cute pictures of herself with her aaji and son on Instagram, is clearly showing us a new way of parenting. It's one that requires discipline and dedication, but also compassion and love. And going by her Instagram posts it is easy to say that Sonali Bendre Behl is probably the most adorable mum around town. Here are 11 pics that prove Sonali Bendre Behl is the most adorable mother! Wonderful event @ANGELXPRESSFOUNDATION! So happy Ranveer got to see the difference that every small deed can make! The force awakens in my son!!!! Is daddy Shakti Kapoor miffed with daughter Shraddha's alleged relationship with Farhan Akhtar?